Unlike any other circuit on the F1 calendar, the streets of Monte Carlo traditionally bring the field a little closer together than anywhere else due to the lower impact of aerodynamic performance. With an average speed of roughly 100mph, mechanical grip and driveability are the dominant performance parameters, although teams will cram on as many downforce producing devices to generate further laptime. Whilst the Principality is not necessarily the ideal place to bring upgrades, the development race never ceases, plus we also got a better look at the Ferrari power unit on Thursday – an item that has been kept in a cloud of secrecy for some time now. Both drivers produced impressive displays on Saturday afternoon and it was such a shame to see both of them retire on Sunday due to exhaust issues. Their relative step up in performance can probably be put down to the car’s rather supple nature – which is more often evident in wet conditions – which aids mechanical grip, plus additional software improvements from Renault over the past month. These two factors will have substantially improved driveability and given the drivers more confidence. Complimenting this general characteristic of the STR09 was a new Y100 (Monkey Seat) winglet above the exhaust. The team were yet to run such a device due to the induced drag it creates and, with the Renault power unit down on power compared to its rivals, there was probably little benefit in doing so. However Monaco represented a chance to load up the car’s rear downforce and the winglet is similar to the one originally featured in winter testing, with two elements arcing around the exhaust to generate upwash at the rear. Fearing that the chasing pack would draw closer than ever in Monaco, I think they always knew they’d have a little in hand. Their race pace was certainly far superior compared to the Red Bulls but with Sebastian Vettel’s turbo failing early doors they could well have dialed Daniel Ricciardo’s power unit back a little as a precaution, hence exaggerating the deficit. Whilst the RB10 is a good chassis, the W05 is a hugely impressive number and it has now won at every type of circuit going. The team did, however, expand on their recent development seen at the post-Barcelona test two weeks ago. The above Monkey Seat was installed on the car in Spain during the first day and has since had some minor additions to extract more from the exhaust plume directly below. Its design is completely new and features curved endplates, enticing the plume to remain straight as it flows upward. 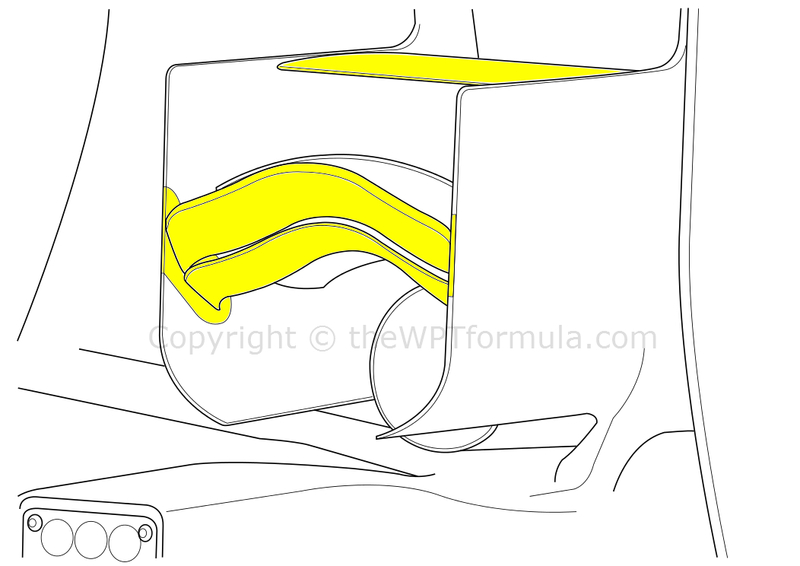 The upward flow is induced by the two, sinuous elements (highlighted) which aim to generate the upwash effect that the teams want at the back of the car. These two elements are a total redesign from their predecessor and are covered in a heat resistant coating on the underside (possibly Zircotec) due to the high exhaust gas temperatures. Sitting above the new elements is a secondary, arched vane that gathers airflow from above the exhaust and forces it upwards towards the base of the rear wing. The other highlighted vane is a horizontal device that is also new. By directing air from above the exhaust onto the upwashing elements further back, the pressure gradient between the upper and lower sides of the winglet is increased, thus forcing the exhaust plume to track upwards more accurately. Red Bull were another team to introduce a new Y100 winglet, this time sitting above the exhaust exit. This compliments the already-exisiting lower winglet which now both work together to push air upward towards the top of the rear wing. The team’s main technical development for the weekend came in the form of its nose camera pods. This came after the FIA instructed the team to do so due to unhappy broadcasters, rather than any performance benefit. The pods were originally tucked inside of the nose cone to reduce drag, which was perfectly legal as the pods were in the defined region given in the technical regulations. What the FIA continuously disregard in its regulations is the third dimension, hence why we have issues such as the Lotus asymmetric tusks and the Red Bull camera pods. Broadcasters were a bit disappointed with the angle of the camera inside of the nose which prompted Red Bull to make changes to their position in Spain, raising the pods a little and providing a larger slot for the lense to peer through. However these alterations still did not provide sufficient images and thus the FIA intervened. 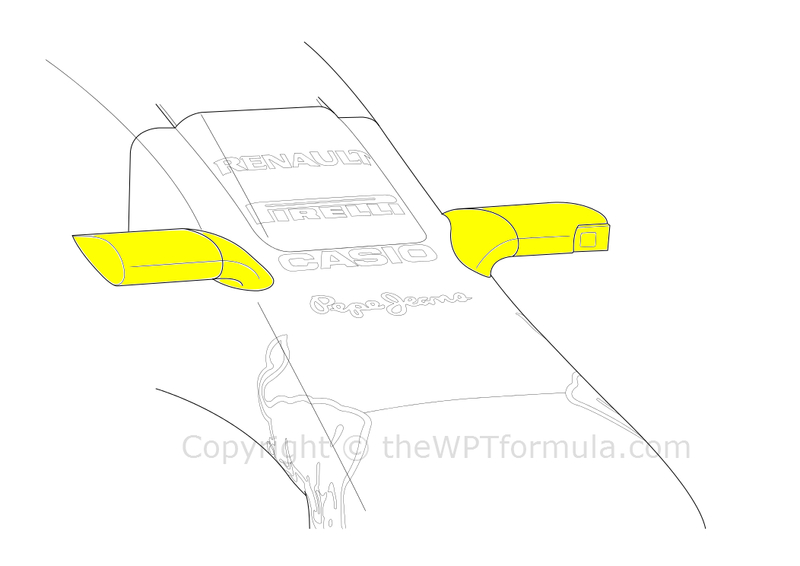 It was also mentioned that the drawings that complimented the camera pod position article clearly demonstrated that the pods must be on the outside of the nose, so the team adopted the Mercedes/Ferrari solution by mounting the cameras on two horns. The horns help air around the side of the chassis and around the front suspension elements but at a drag penalty. We could well see the team playing about with their position as the season goes on to reduce this impact, as they have done in previous seasons. Like Toro Rosso, Mercedes and Red Bull, Lotus also updated their Monkey Seat winglet. The simplistic single element device introduced in Barcelona has now been overhauled, replaced by a twin element design but still featuring the offset mount from the curved central rear wing pylon. Lotus have also been experimenting with pressure gradient vanes on the front wing endplates, too, with two different layouts appearing on the car since the Spanish GP and testing, although Monaco was the first time that both cars ran a configuration of some sort for the race itself. Finally, the rear wing endplates received a leading edge tyre wake slot in order to capture the turbulent mass of air and draft it away from the diffuser’s side and top walls. These slots have been less popular this year because of the tyre’s stiffer sidewalls generating less turbulence, but as the cars regain downforce the more loading the tyre will undergo and thus the greater the turbulence generated as the sidewalls deflect. 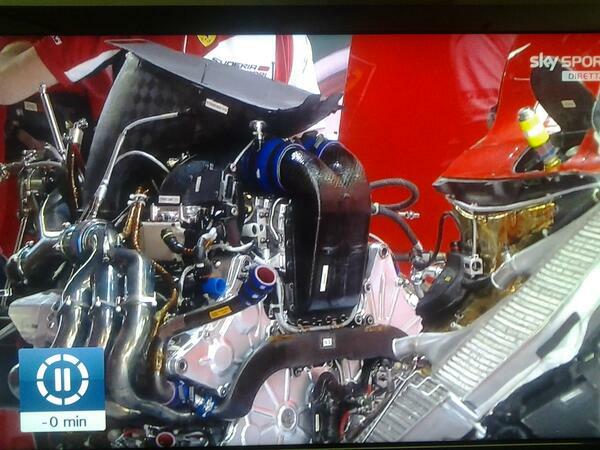 On Thursday Practice, Sky Sports F1 broadcast some fantastic images of the Ferrari power unit in its most ‘naked’ form yet. Whilst I’ll have a more in-depth analysis on Richland F1 over the coming days (I will link it on my blog, too), it is worth noting some key features from this image. We can see that the plenum (the black box with two branches at the centre of the image) is mounted in the middle of the ‘V’ of the engine and exits back in towards the centre. This indicates that the intercooler is actually mounted in the middle of the ‘V’, with compressed air drawn in by the turbo passing through a very small series of pipes into a water-jacketed intercooler before flowing back into the cylinders. The advantage of this is that the pipe network is very small in comparison to the Renault and Mercedes solutions, reducing turbo lag and decreasing the volume of the sidepods, which benefits aerodynamics. A drawback of this design is that the overall system is heavier due to the water jacket (with the water itself having to be cooled) and puts customer outfits – Marussia and Sauber – at a disadvantage as they have to excessively weight save elsewhere as a consequence. This entry was posted in 2014 Highlights, Technical Highlights and tagged bull, ferrari, gp, highlights, lotus, mercedes, monaco, monkey, power, red, seat, tech, unit, winglet, y100 on May 25, 2014 by thewptformula.